Mindfulness is a way of paying attention to whatever is happening in our lives, inside and out, in the present moment. When we connect with the present, we become aware of habitual patterns of thought, emotion and behaviour. With mindfulness, we train ourselves to pay close attention to what is going on in the present moment; just as it is. Much of our suffering is a result of regrets about the past, worries about the future or judgments about the present. When we are mindful we become aware of and explore these habitual thought patterns and ways of reacting. This attitude of curiosity allows us to create new and healthier ways of responding to life’s challenges. Mindfulness is not a religion—anyone, with any belief system, can enjoy its benefits, many of which are based in research. Mindfulness practice, like physical exercise, requires repetition and time to produce noticeable changes in everyday life. Over time, thanks to neuroplasticity, practising mindfulness can change the physical structure of one’s brain. Mindfulness is practised mainly through consciously focusing one’s attention on a particular object, such as the breath, body, emotions, thoughts, or sounds, or by bringing an open and receptive attention to the coming and going of thoughts, emotions, and physical sensations. When practising mindfulness, the attention will naturally be pulled to stimuli that are greater than our capacity to stay focused on a chosen object (e.g. breath or body sensations). This will happen again and again. At some point, we notice or wake up to the fact that our attention has moved into such places as daydreaming, our to-do list or a recent argument with a friend. This is the crucial moment when one crosses over from automatic pilot to mindful awareness. Only then can we bring our attention back to our intended object of focus. This act of returning our attention, over and over again, is the central practice, the thing that builds our mindfulness. 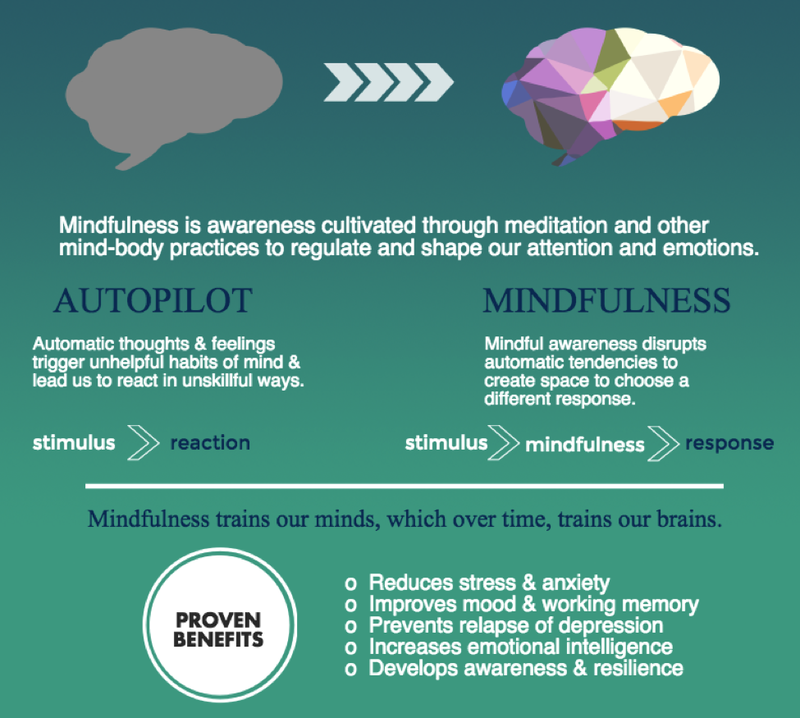 Is there evidence supporting the benefits of mindfulness? See our Evidence page to learn more. In addition, there is a world of information out there. Check out the links on our Resources page if you want to explore.